Asked their feelings about Mr. Trump personally, a mere 9% of all voters said they are neutral. 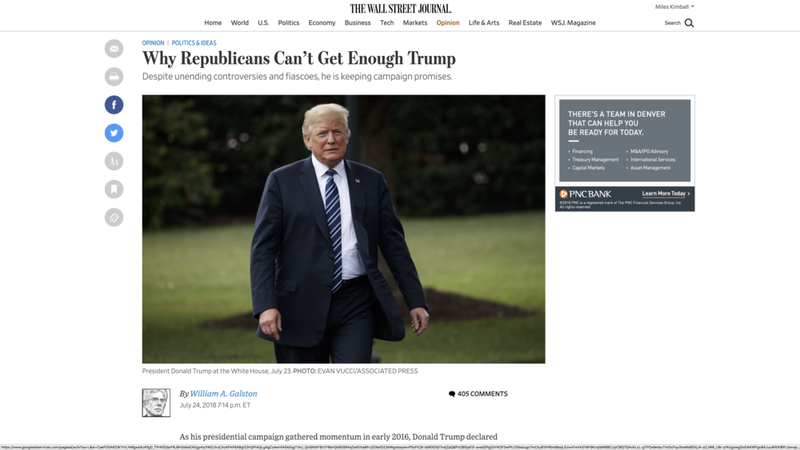 I thought William Galston's op-ed the next day, "Why Republicans Can’t Get Enough Trump" was very insightful in explaining why Republicans who didn't vote for him in the primaries have gone beyond making their peace with Trump (as they did before the election) and have come to actively like him. William makes three points. Improving Economy. Due to the Fed's belated and too timid, but ultimately successful efforts, the economy was likely to improve no matter who was president. But Donald Trump has done enough to claim credit for the economy. Tax cuts and deregulation in particular seem plausible factors behind the improving economy to Republicans. He gave economic conservatives the tax cuts and deregulatory policies he advocated during the campaign. Social conservatives have gotten the judicial nominees they were promised, along with policy changes in areas from transgender bathrooms to abortion and religious liberty. And the populist conservatives who put Mr. Trump over the top in key Midwestern states have found an unswerving champion of the nationalist policies—on trade, immigration and putting America first—that energized them during the campaign. In Donald Trump, dissatisfied Americans have found a man who resents cultural elites as much as they do, who is as dismissive of convention as they would like to be, and, above all, who fights constantly, retreats rarely, seldom apologizes, and takes every setback as an opportunity to renew the unending struggle. The mutual bad opinions that the elites and whites without a college degree have of each other reminds me of attitudes nationalists have about foreigners. It is unfortunate. Dan Benjamin, Ori Heffetz and Miles Kimball—Repairing Democracy: We Can’t All Get What We Want, But Can We Avoid Getting What Most of Us *Really* Don’t Want?